Plesiosaurs were a group of aquatic reptiles that lived in both marine and freshwater environments. They evolved during the early Jurassic period or late Triassic period, from Nothosaurs, and went extinct during the Cretaceous-Tertiary mass extinction. Plesiosaurs had a broad body, short tail, and four limb flippers. The term "Plesiosaur" includes the so-called "true Plesiosaurs", which had a long necks, and the Pliosaurs which had shorter necks and a larger head. Plesiosaurs varied greatly in size, the adults varying between 10 feet (3 meters) and 66 feet (20 meters) in length, depending on the particular species. Perhaps the most remarkable are the family of Plesiosaurs known as "Elasmosauridae", which includes species such as Elasmosaurus and Thalassomedon, who had necks that made up half or more of the length of the creature. 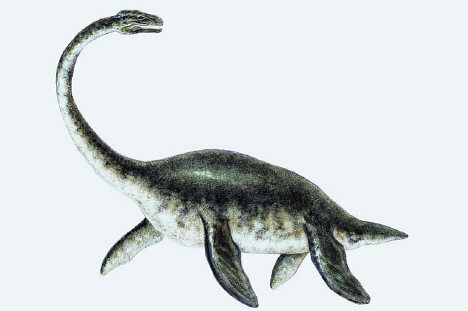 Plesiosaurs are often drawn with their necks positioned upwards in a swan-like posture. However, this is now thought to be unlikely to be an accurate depiction - it is thought they necks were probably not flexible enough to do this, and, in any case, such a posture would probably have tipped them over. In life, Plesiosaurs are believed to have been the top ("apex") predators of the oceans. It is thought perhaps they swam slowly below the surface of the water, and then used their long necks to position to snap up fish or cephalopods. Stones have been found in the stomach area of some Plesiosaurs (including Thalassomedon), and it is thought perhaps that these were used as ballast and/or as an aid to digestion (similar to gizzard stones in modern birds being used to grind up food). The first recorded Plesiosaur fossils were found in England - these include a partial skeleton found by Stukely in Nottinghamshire in 1719, and others found by Mary Anning. As a result of this, an impressive collection of Plesiosaur fossils are now found in the Natural History Museum and London. A number of alleged lake monsters (animals supposedly living in freshwater lakes) are sometimes claimed to be living Plesiosaurs. These include Champ which supposedly lives in Lake Champlain in the United States, Ogopogo which supposedly lives in Lake Okanagan in Canada, and most famously of all, Nessie which supposedly lives in Loch Ness in Scotland. Mainstream scientists are generally skeptical of these claims for a variety of reasons including lack of physical evidence, the lakes are generally too small to support a viable breeding population, the lakes are often too cold, and bodies of dead animals have not been found. Cryptozoologists (people who search for rumored or mythical creatures whose existence is uncertain), and of course tourists to these areas, however continue to look for these creatures. The early Jurassic period was not just a time when giant reptiles roamed the land. They also swam in the prehistoric seas. Plesiosaurus, with its long, thin neck and paddle-like limbs, was one of the large marine reptiles that lived at this time. Full-color images and interesting, accessible text will help students find out more about what life might have been like for this underwater creature that could grow to a whopping 16 feet in length. Readers will learn about the exciting adventures of a young Elasmosaurus as he grows from a youth into an adult. These stories unfold through fast-paced narrative and stunning graphics. They may be scary-looking but they definitely have important functions in securing the biodiversity of marine life. Learn about these sea monsters by ÒmeetingÓ them face-to-face. 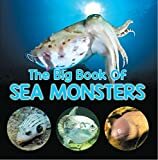 The use of picture books in introducing sea monsters will help you slowly accept them and not be feel scared towards them. Picture books work by capturing the attention to help you remember facts better. Buy a copy now! By Nathanial E J Hogan Age 8, "Dinosaurs!!! 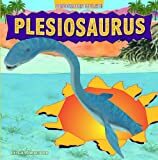 Kid's Book About Plesiosaurs from the Triassic, Jurassic and Cretaceous Periods (Also known as Plesiosaurus). Awesome Facts & Pictures for Kids about Dinosaurs" is an awesome non-fiction ebook with many colourful pictures that look great on Kindles, Ipads, mobiles and many other tablet-style hand-held devices. The facts are presented in easy to read 'bite-sized' sections accompanied by a picture to help children not only learn about Plesiosaurs but to also enjoy reading about these famous dinosaurs. A perfect way for kids of all ages to learn. "...Plesiosaurs.." is also great for parents to read to children who are not yet ready to read for themselves. This gives parents a great opportunity to discuss their children's favourite subject with them and to explain things further. Ninety million years ago, giant dinosaurs roamed the earth, pterosaurs ﬂew through the air, and giant reptiles and ﬁsh hunted in the oceans. The area that is now Kansas was covered by water and one of its inhabi-tants was the plesiosaur—a reptile with an extremely long neck and a huge body. This early reader about the ancient plesiosaur brings the prehistoric world of this ocean-dwelling animal to life, explain-ing how scientists think these reptiles lived, hunted, and became extinct. Back matter explores other reptiles both ancient and modern and provides additional print, visual, and web resources. Sharp teeth and excellent hunting and swimming skills made plesiosaurs dangerous additions to prehistoric oceans. Young readers will get a glimpse of what life was like for these fierce predators as they scoured the waves in search of their next meal. A day in the life of a plesiosaurus, an air-breathing, prehistoric, marine reptile, as she lays eggs, escapes other predators, searches for food, and fights a storm at sea.